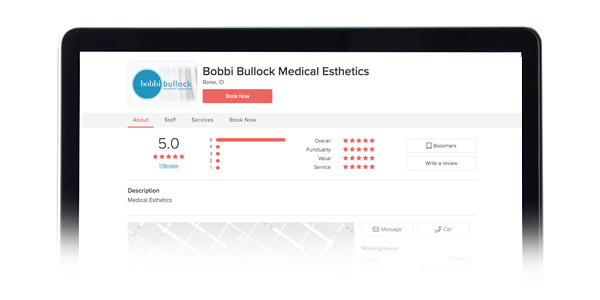 Freshen your look with a custom, personalized full facial rejuvenation plan from Bobbi Bullock Medical Esthetics. We will divise a custom plan using combination of all tools available for the optimal outcome. Plans may include a combination of Botox, fillers, and other skin care solutions. Botox is a prescription medication that is injected into facial muscles to temporarily decrease wrinkles, creating a youthful, rested, peaceful and happy appearance. It can be used to drop a gummy smile, cease frowning, and arch the brow. Botox helps the inside match the outside, reflecting the youth and energy you feel but are no longer showing. It can also temporarily stop or decrease underarms from sweating. Facial results typically last 3-4 months, underarms 5-9. The number of units are dependent on age, real estate, gender, and desired results, with an average of 20-55 units. Lip injections smooth creases, give shape, and return the plumpness of youth. As you age, your lips naturally thin and lose their contour. This is a quick procedure that takes your appearance. A cannula and numbing cream are used for comfort and safety, minimizing, pain, swelling and lip trauma. As always, Bobbi Bullock NP-C guarantees her work as she understands what is popular. classic, and natural. She knows how to deliver desired results, while avoiding duck lips, creating a natural, beautiful smile. This robust injectable hyaluronic acid gel is used in tissue where moderate to severe facial wrinkles, and folds occur. This treatment is is especially useful around the nose and mouth, helping fill naso-labial folds, fine line and deep lines, while giving support and structure to jowls. Bobbi Bullock NP-C uses a cannula for comfort and safety, which also minimizes pain, swelling and trauma. Numbing cream can be requested at no additional charge for comfort. Vollure, is a Voluma hybrid, and has been approved for the correction of moderate to severe naso-labial folds and jowls. .Vollure’s Vycross Technology creates a more connected gel, which can be molded, effectively lifting sunken skin sitting above it. Vollure sits in that sweet spot where it is firm enough to fill the line, but soft enough to move naturally with facial expression. Bobbi Bullock \\IP-C injects more Voluma than anyone else in the state of Idaho, and it is her #1 go-to product for lifting sag and creating beauty. This is a 45-minute miracle face lift with no incisions, scars or downtime. Regal high cheekbones create contour and angles once only seen on high-fashion models. It lifts the side cheekbones that have flattened out from side sleeping and age-related bone and fat loss. These new cheekbones pull up the jowls and shorten the tear troughs, which eliminates the dark, tired circles under the eyes. Finally, it lifts the naso-labial folds pushing the beautiful cheek-apple upward, slenderizing a round face and elongation the chin and neck. Voluma is injected directly on the cheekbone to create structure, and you will leave the office looking better than when you arrived! Volbella is a crystal-clear gel that is injected directly into and around the lips, using an ultra fine needle or cannula to improve peri-oral lip lines or “smoker’s lines”. It is the only hylauronic acid that can be placed very superficially and is ideal for patients who are not interested in increased volume but are instead looking to simply reduce the appearance of fine lines and wrinkles around the lips. Vobella is used off label to beautifully fill these areas safely with a cannula application. Its unique qualities make it a perfect choice for these advanced and difficult to treat areas. This painless and advanced medical technique removes dead skin cells, superficial sun spots, and vellus hairs, leaving the skin soft, glowing, and radiant. A surgical scalpel is skillfully backhanded over the skin at a degree and depth that is up to the client’s needs and comfort level. The skin is then ready to receive a luxurious oats and honey mask under a hot towel for deep penetration into the dermis. Any extractions your face needs will then be done. Beautiful batting eyelashes are the oldest trick in the book for charm and male attraction. Are your lashes thinning and shortening? Has your mascara been difficult to apply? Prescription Latisse is a simple solution that is self-applied once a day to the upper lash line, and results in your own longer, darker, and thicker lashes without make-up, extensions, or glue. Lashes will return to their normal state about 6 weeks after discontinuing the application. It is a fun, easy, and natural way to regain your eye candy and self- confidence! Are your anti-aging treatments failing you, or are you confused about what products to use? Let nurse practitioner Bobbi Bullock evaluate your skin during a medical visit while performing a thourough evaluation of melasma, aging skin, rough texture, scaring, and acne. Prescription Retin-A (anti-aging, texture and acne) or Hydorquinone (melasma, sun damage and spots) from Bella Medical will be given. We know that everyone’s time is valuable. Because of this, clients will be required to keep a credit card on file and will be charged a $100 fee if they no show or do not give proper notice. We understand that situations arise in which you must cancel your appointment. It is therefore requested that if you must cancel your appointment you provide more than 48 hours’ notice. (Call or text 208-949-9904) This will enable another person who is waiting for an appointment to be scheduled. Patients who do not show up for their appointment without a call or text to cancel will be considered as a “no-show”. We understand that special unavoidable circumstances may cause you to cancel within 48 hours. Fees in this instance may be waived but only with management approval. We believe that a good practitioner/patient relationship is based upon understanding and good communication. Questions about cancellation and no-show fees should be directed management (Summer Foley 208-859-5381).